Elle: Exercise gives you endorphins. Endorphins make you happy. Happy people just don’t shoot their husbands, they just don’t. So true, Elle. So true. I was in a bit of a funk this past weekend. The usual: judging myself, thinking I’m less than. I worry if I’m a good enough parent, wife, creative type, etc. It’s the byproduct of forgetting who I am. It’s amazing what a little talk and exercise will do to change a funk. Seriously, I’m thinking I need to watch Legally Blonde again. What other life lessons did I miss the first time around? Bend and snap? It might be too late for that. I went to work out at CrossFit Monday. I know, CrossFit, this, CrossFit that. What can I say, it’s greatness. Anyway, I walked away happy. I mean, how is that even possible? I just sucked wind at a workout. My arms feel so tight I wonder if I will even be able to straighten them out later. I’m not as good as half the people working out next to me, nor do I even look as fit. But I’m happy. How in the world do you explain that? Endorphins, for one. It may not win any medals or awards, but sometimes just finishing a workout deserves recognition. Seriously, I’m amazed that I don’t turn around and drive back home most days. Most of the time my palms get sweaty and my stomach feels queasy and that’s just on my drive to the gym. Those two things can sometimes be enough motivation not to work out. I mean, who in their right mind considers running 200 meters part of the “rest” period? My palms are sweaty again. But then there’s the community. People root for you, they encourage you to do better and give more than you thought capable. They tell you you’re strong for lifting 175 pounds and mean it even though they can lift 500 pounds. No seriously, they mean it. You are strong, because you tried it. I’m not sure I’ve ever encountered this at any other gym. Ever. Don’t get me wrong, when I first started CrossFit, I was petrified. Scared of being less than especially when people ask you questions like, “Do you run?” To which I responded, “Like, do I like to run? No. Will I run if a rabid dog is chasing me, yes” Or worse, “Let’s try hand stands.” Oh goodie, my fave. 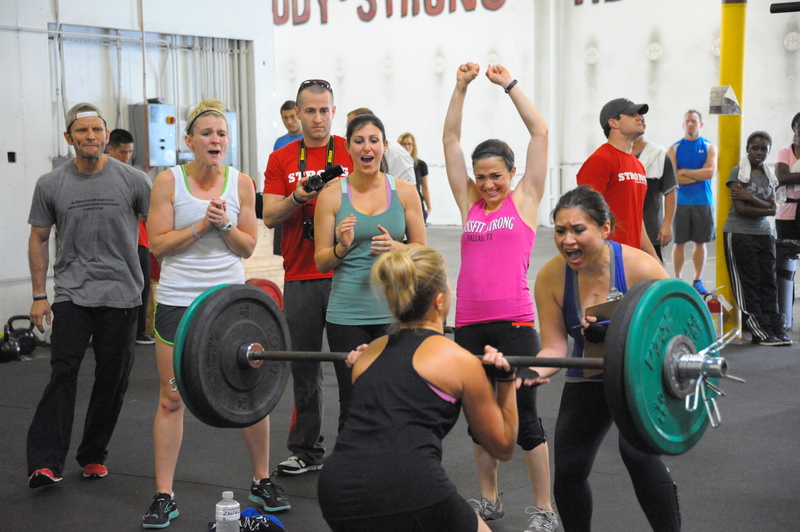 So maybe CrossFit is not for you. Who cares? Find some endorphin producing, community driven activity. I’m with Elle, exercise gives you endorphins, endorphins make you happy. So does community. Try it. This entry was posted in Life Lesson and tagged Crossfit, endorphins, happy, Legally Blonde. Bookmark the permalink.